Sono Sion, one of Japan's most divisive and unpredictable directing giants, has made an original series that will stream on Amazon Prime Japan starting on June 16th. Hopefully that will be followed by other territories around the World but for now you can watch the trailer below and get a sense of the madness, chaos, violence and beauty that Sono can make when someone throws a few Yen his way. All the trademarks are there. It simply looks, better. The full press release is below followed by the trailer. 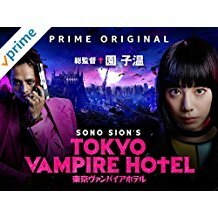 Amazon is to start streaming its latest Japanese Amazon Original series Tokyo Vampire Hotel exclusively on Amazon Prime Video in Japan from June 16, 2017, with all 9 episodes available for customers to stream. Amazon Prime members can watch and download the program via the free Amazon Prime Video app for iOS and Android mobile devices, Amazon Fire TV, Fire TV Stick, Fire tablets, game consoles, smart TVs and online at www.amazon.co.jp/primevideo. 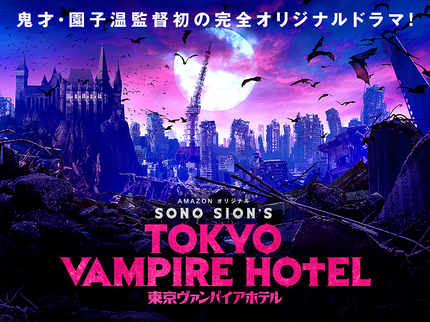 Tokyo Vampire Hotel, Sion Sono’s first drama series based on a completely original screenplay, depicts a battle to save mankind from a vampire tribe that aims to destroy mankind and the earth itself. All of director Sono’s famous hallmarks are here: intense action, theatrical direction and wit. The all-star cast includes actress Kaho, taking on her first full-scale action role; Shinnosuke Mitsushima, a young actor attracting attention in various fields; Ami Tomite, a young actress who is being mentored by Sono himself; Yumi Adachi, an actress taking on two monstrous roles; and Megumi Kagurazaka, the director’s wife and a frequent performer in his films. The series boasts magnificent production values. It was shot on three soundstages at Nikkatsu Studios in Japan and on location in the homeland of vampires, Transylvania, Romania, including the legendary Count Dracula’s castle, an ancient underpass, the spectacular salt mines of Salina Turda, and more. The story opens with a ferocious gun battle and action scene. The same day, young men and women are invited to the Hotel Requiem. A mysterious man Yamada (Shinnosuke Mitsushima), a strange Empress (Yumi Adachi) and Elizabeth Bartoli (Megumi Kagurazaka) reside in and manage this beautiful palatial hotel. From across the country, young men and women have filled the hotel for a dating party organized by Yamada. Suddenly Yamada announces that the world will end tomorrow, and the only people to be saved are those in the hotel. Some people are stirred. Some are incredulous. “Those who remain here will survive! To become our food!” Under the hotel lies a vast cavernous space. Yamada says the only way for humanity to survive is to live there, procreate and proliferate, and continue to be eaten by the Empress, Yamada and others of the vampire Corvin tribe in eternity. The young people gathered in the perfect shelter of the hotel witness the end of mankind and the earth. The ashes of death rain down outside the hotel. Some, in despair, try to break free from the control of the Corvin tribe and flee outside. Others submit to their dominion. To save Manami, K attempts to kill the Corvin tribe. The battle for survival between mankind and the vampires begins. Will humanity survive? Why was Manami targeted by the Corvin and Dracula tribes? And what is K’s fate? Das klingt ja fantastisch (und sieht super aus)! Bring it on! Hoffentlich kommt das auch zu uns. Staffel 1 (mit 10 Folgen) ist jetzt auf verfügbar. Synchro gibt es keine, liegt auf Japanisch mit englischen Subs vor. Gerade die ersten 10 Minuten gesehen. Du wirst es lieben.